These videos are shot with a unique "top down" camera angle. I have eliminated the extra mental effort that results by having to switch everything from right to left and left to right. Most video instructional videos have the camera position out front and what you see on the screen does not look like what YOU see when you look down at your instrument. I fixed this by positioning the camera on the ceiling to create the same visual field that you see when you look at your instrument. 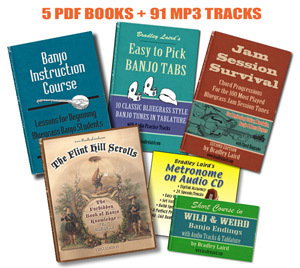 This downloadable course will teach you how to play bluegrass style banjo by ear. Many people struggle with trying to read notation for banjo (tablature) and I created this set of 5 QuickTime video lessons to get you playing quickly. Think about it... Most of the great banjo players, people like Earl Scruggs and Ralph Stanley, DID NOT learn to play using written tablature! So why should you? This two-hour course teaches by showing you things in careful detail and by playing exercises over and over at a slow speed until you get them. Every lick and exercise that is taught becomes a building block for playing songs later in the course. If you have been confused by trying to learn from books and tablature give this method a try and you'll be picking in no time. These videos are equal in length to 4 private lessons which would cost you five times as much. And, with these videos you can repeat them as much as you need to. Note: The QuickTime video files are pretty large so it is best to download to your home computer and be patient for the download process to complete. You'll download a .zip file which will contain a folder with all 5 videos and the written PDF materials. 5 QuickTime video files and 2 PDF documents. 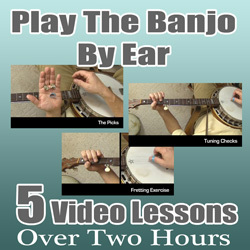 To download the 5 video Play Banjo By Ear course click the button below. iPad users should read these tips before purchasing.